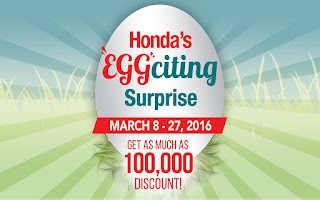 Honda Cars Philippines, Inc. (HCPI) kicks off the month with Honda’s EGGciting Surprise Campaign for customers who will inquire, reserve, and purchase a brand new Honda vehicle from now to March 27, 2016. Qualified customers will be entitled to a discount coupon worth up to P 100,000 on top of all ongoing dealer promotions , and Honda’s exclusive offer to loyal Honda customers. To avail of this “EGGciting” offer, qualified customers will draw a special Easter egg. Each egg consists of a corresponding EGGciting Surprise discount coupon worth P 5,000 up to P 100,000. Customers will only be entitled to one (1) coupon, which can only be redeemed until the end of the month. 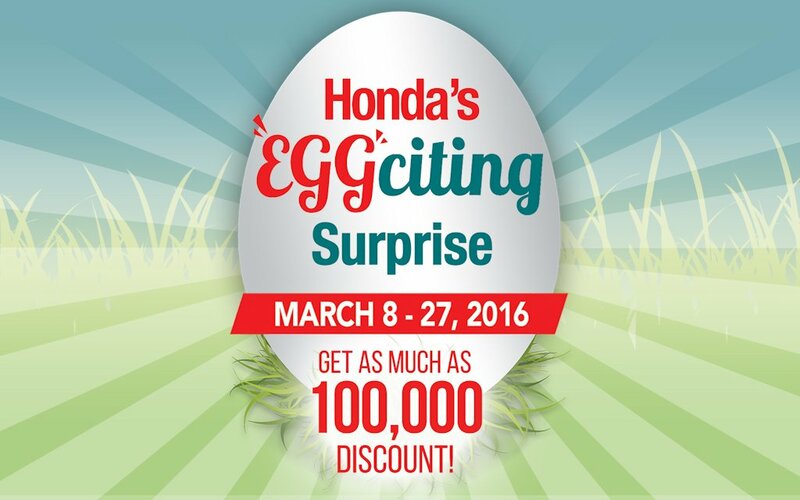 Customers may also check out and test drive Honda vehicles at SM Mall of Asia, and avail of this EGGciting offer from today until March 16, 2016. Wish to have a chance to come there so much!